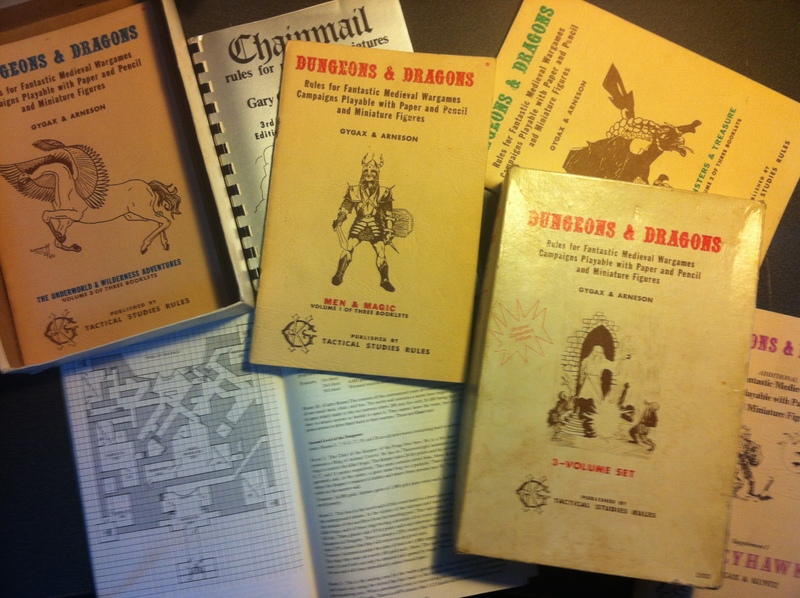 Last week I shared what I could about the playtesting of D&D Next and drew parallels to the experience of going back and running OD&D (the first “white box” version of D&D) for the first time. One of my big surprises was how much fun everyone had during the first session. Sure, everyone came into it with a very positive mindset, but I still expected the weaknesses of the rules to pose greater barriers to our enjoyment. Later editions had added so much to the game. Would a second session provide different results? What parallels exist between this learning process and playtesting D&D Next? The party continued through the swamp, following the directions given by the Nixies. They caught a glimpse of the bandit town outside of Blackmoor and its massive walls and swarms of troops, but continued until they reached an overgrown wall and a crevasse leading into darkness. Magicuserelf (clever name), ordered the hireling, Falath, into the darkness. The dwarf, Borkin the Broken, said he did not wish to enter. Cue Larp (his name later became Lard) casting Charm Person on Borkin and we all entered (along with Chuktasta, priestess of Ra (we briefly used the deities found in Supplement IV)). Rukia, the cleric, lit a torch. I silently noted that I had no idea what a torch did in this edition. Within they found a stone door bearing a small indentation. Larp realized that the rings they carried afforded egress when pressed into the indentation. 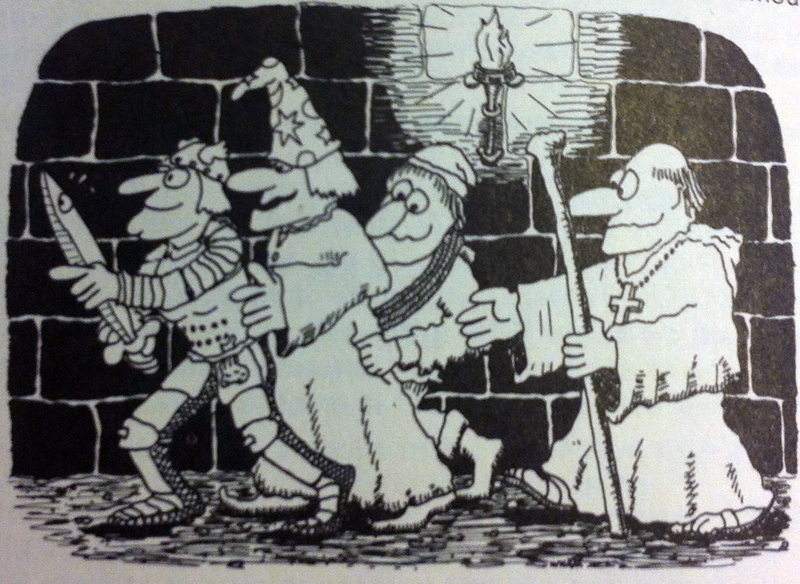 The door opened, leading them into the dark musky dungeon beneath the Temple of the Frog! I asked who would be doing the mapping and handed a sheet of graph paper to the player of Borkin. This was an old school moment, and probably eye-opening for some. Players used to map their exploration. It has some benefits. You simulate the confusion that might take place when an adventurer tries to quickly map as they walk. You also create a sense of the unknown, because the blank space is so very apparent. A passageway not taken becomes a blank area and nags at the players. It also has downsides, as it eats up some time, focuses on one player, and is fairly repetitive. (After the fourth 2×3 square room, the interest level drops). It is fun to note that the paper we used for character creation, as well as that used for mapping, was the same paper I used to play with when I started playing Basic in the early ’80s. I grew up in Colombia, South America, and brought my old gaming paper with me when I brought my books over to the US. That means these sheets of paper were older than some of the players!!! We had some fun reading over the rules for doors and traps. Dungeon doors are always stuck, opening on a 1-2 on a d6. (Despite having polyhedral dice, OD&D sure uses the d6!). Traps activate on a 1-2 on a d6 whenever a PC passes over them (apparently all traps are on the ground). PCs can listen at doors, but humans only hear what is in the next room on a 1 (other races on a 1-2). All monsters have infravision, but lose it when hired by PCs. And so began the process of opening doors. I had forgotten about this. The constant checks to see if you could even open a door! Wow. Several doors would be left unopened as no one could enter them. Imagine the impact on adventure design when you don’t even know if PCs could enter the room with your important plot point! In some cases this was in their favor, such as when they did not open the door to a very nasty beast. D&D Next has the goal of acting as a universal rules system that borrows the best from each edition. Just the simple OD&D version presents real questions as to how that can be accomplished. Some might think the mapping of old was fantastic. It certainly has positives. But it also creates negatives. 3rd and 4th really moved into a situation where the map of the dungeon was far less critical than the rooms themselves. Exploration increasingly became entering a room or a situation: the encounter. It is clear to most that this focus robbed us of some story. But in playing OD&D it is also clear why we moved away from older systems. There is a balance act here, and perhaps also room for innovation. If Legend & Lore indications are true, D&D Next will have some modular aspect. That may be a way to marry these differences between editions and between gamer styles. That may seem like an insurmountable task, but it need not be. Wizards doesn’t need to please everyone perfectly, just to provide options that are pleasing enough. Many of my friends run mapless 4th edition combat; it actually works really well. I mean, if we can abstract so many things in OD&D, we can certainly abstract a “slide 2” to have it still be meaningful. Being able to toggle the role of the map, of the encounter room, of the grid… this would be very powerful. This is where I am really glad that Wizards will be using an open playtest. I think playtesting is less about voting on what everyone likes, but rather in establishing patterns of responses and seeing what clever alternatives and best scenarios can be uncovered for the different audiences/demographics. I playtest very often and even a single adventure encounter will see four different experiences at four tables. I never expect to please everyone the same way, but rather to offer each aspects that will make this enjoyable on the whole. I also aim to provide the Dungeon Master with knowledge that can help them alter the encounter during play to achieve the desired result. Some gamers may feel that Wizards is making a hollow promise to allow playtesting. I’ve in the past written how impressed I was in meeting Wizards staff. They really like playing D&D and they really want our game to be better through what they do. I think this has become increasingly true in recent years, with an emphasis on connecting with gamers. I sense genuine excitement when they say they want to design this edition with fans. Now, let’s be realistic. At the end of the day, they should also create the game they want to publish. They need to be passionate about their game. And there will be tough calls where they must use their sole judgment. This happens in any creative process. But what I hear is a true commitment to making this as collaborative as possible and to give the process the time it needs to properly collect feedback. I suspect this is in part possible because the market really needs a very good D&D Next and because 4th Edition is probably at its best right now. Recent releases have been innovative and of very high quality. They can deliver D&D Next when it is ready, rather than feeling intense pressure to deliver it soon. This entry was posted on October 12, 2015 by Alphastream and tagged 5E, OD&D, RPG History.